Throughout history, light therapy has been a common treatment method for treating various medical conditions, such as psoriasis, pneumonia, lupus, tuberculosis, or vitiligo. In the early 1900s, as an effective protocol, light was used to treat a variety of illnesses, too. The popularity of this practice began to diminish as of the 1950s, due to the use of antibiotics. However, as our bodies become more resilient and less reactive to antibiotics, IV light treatments are resurfacing and being reintroduced back into the medical field today. Additionally, drug-resistant infections have become widespread, causing alternative therapies to become crucial during the development of finding cures. I have suffered with an autoimmune disease called Hashimoto’s Thyroiditis for several years. Because of this I have experienced several symptoms such as; puffy, dry eyes, difficulty managing my weight and constant fatigue. I literally felt like I had a hangover every day though I did not drink the night before. 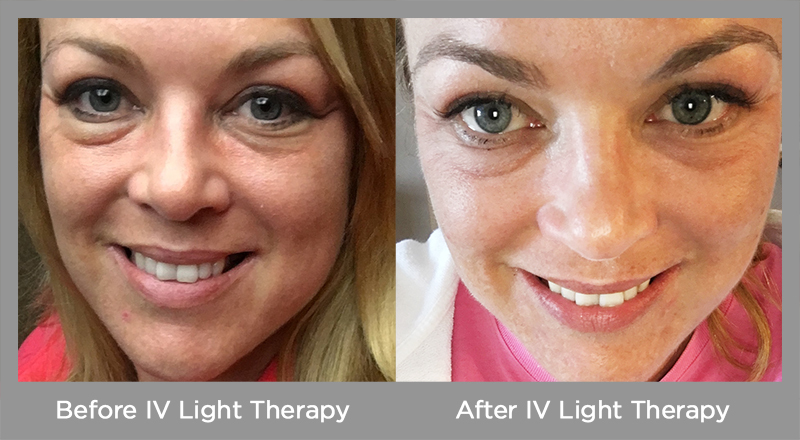 Dr. Stratt recommended that I try his new IV light therapy and after just 1 treatment I can say that I have not felt better in years! My energy level is through the roof. I am able to go about my daily routine and even added more workouts to my day without experiencing the dreaded afternoon crash. One of the most noticeable benefits was that the day after my first treatment my eyes were 70% less puffy than usual. I have tried everything and seen many specialists with no luck. This treatment is the only thing that has given me hope. I have since signed on for a series of 10 consecutive treatments and am extremely impressed with results so far. Thank you Dr. Stratt and LifeBOOST! 1) Complete absence of any stiffness throughout my musculoskeletal system, best felt the following morning during my workout where I typically would need more time to warm up and loosen up. My body felt extremely loose and light which allowed me to push extremely hard for the workout. 2) My energy was extremely high and found that my endurance was notably better than typically. I would usually hit “the wall” towards the end of the workout, but felt I could have done the whole workout a second time. 3) for about 3 days following, I found my overall energy and mental clarity to be notable higher than usual. Especially Saturday which usually finds me feeling somewhat fatigued from the week, but I felt very non-fatigued and even had some alcohol (too much) on Saturday night, yet still got up earlySunday morning and had another great workout. That’s just from 1 treatment; I plan on doing this weekly for about 6-8 weeks. What Conditions Does Light Therapy Help With? The demand for natural remedies and therapies is becoming frequently desired. There is more information and supporting research regarding light’s effects on the human body today than ever before. To further understand this simple treatment and to take control of your health today, call (561) 922-9967.